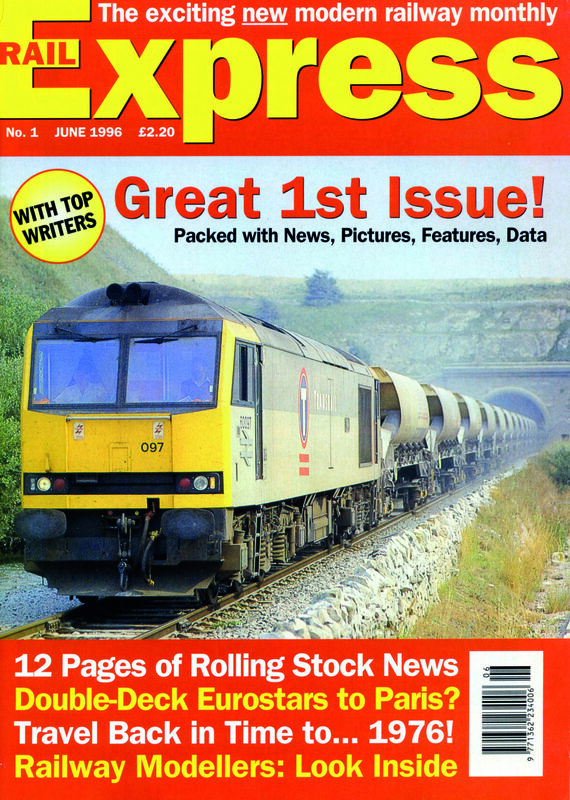 There were those that said we wouldn’t last more than a few issues, but over 20 years after our launch in 1996, Rail Express is still going strong and this month we pass the 250 issue milepost. Here’s a look back over some of the key moments in our history so far. THE story of Rail Express is that of the privatisation era of Britain’s railways. Launched in 1996 at the height of the sell-off of British Rail’s businesses, we have charted the fortunes of the various passenger and freight organisations that have existed since then – but always from the point of view of what is happening to the locos, units, coaches and wagons. Issue 1 was dated June 1996, but was launched at the open day at Tinsley depot, Sheffield, on April 27 that year. Strange to think that this once major diesel depot is now confined to the annals of railway history – something unimaginable on our launch day, but representative of the way our railways have changed massively in just over two decades. The launch issue was co-edited by Murray Brown and Philip Sutton, who set out the stall for every issue since: Rail Express is written by enthusiasts for enthusiasts of the modern traction scene, with our key pillars being news, nostalgia, preservation and modelling. Amongst the team of writers back then were David Rapson, David Russell, ‘Industry Witness’ and William Watson – all of whom are still part of the Rail Express team today. Making the news in Issue 1 was a plan to build double-deck Eurostars for use on the Channel Tunnel Rail Link (now called HS1) after its scheduled opening date of 2003, the plan then being to use double-deckers to St Pancras and the existing Class 373 fleet to Waterloo. The first stage of HS1 from Dollands Moor to Fawkham Junction in Kent did open in 2003, but it was 2007 before St Pancras was reached, at which time Waterloo International closed. We are still to see double-deck trains used, although it is interesting to note they have again been proposed for use on HS2 out of Euston. We also reported on the move of the NRM’s ‘Deltic’ No. 55002 going to the East Lancs for an extended stay; there was a look back to 1976 in the first ‘Rattle & Roll Years’ photo nostalgia feature; while modelling got underway with news of limited edition Class 37s from Lima. Read more in the Spring Issue of RE – out now! Previous Post:Welcome to Issue 250!